I didn’t know what to expect when my shoes hit the asphalt in Puerto Rico. It was new ground and a new environment with my beautiful significant other instead of the usual crew of seasoned artisans in Nadus Films. I had brought my camera equipment, but had also brought the intent to relax and have a good time with some of my closest colleagues in the photography industry: RGG EDU. Once a year, RGG EDU hosts an exotic party for its employees, friends and industry leaders. Last year, the plan was set in place when Hurricane Maria slammed with full force into Puerto Rico devastating the island and plunging its 3 million residents into a desperate humanitarian crisis. Obviously, the party was put on hold for awhile. Puerto Rico, is an island territory of the United States, located in the Caribbean Sea. While, It’s known for its white sand beaches, historical medieval architecture, and vast rain forest, the island has faced a recession for over a decade, well before Maria hit. Nearly half of residents live below the poverty line, by far the highest poverty rate of any United States territory. The devistation of Maria, the worst storm to strike the island in over 80 years, will haunt Puerto Ricans for years to come. While the official reported death toll was 64 people, recent research from Harvard suggests the hurricane resulted in more than 4,600 fatalities. The storm left thousands of families without homes and destroyed some communities entirely. Today, thousands remain without power and many remain without access to clean water. While I do my best to stay up to date on foreign humanitarian crises, I'll be the first to admit, I was totally naive to the true destructive impact Maria had had on the island of Puerto Rico. As a visual story-teller at heart, I knew I could use my talent to highlight a story during our stay on the island. Upon arrival at the beautiful Gallery Inn in Old San Juan, we were all handed a mission: capture a portrait and record a story of someone affected by Hurricane Maria to raise global awareness for disaster relief. While it was a simple assignment, I wanted to make it special for not only the person I photograph, but also the people who eventually see the photography. While much of the trip was indulging in delicious mofongo, late-night cocktails and photography talk, I wanted to spend one solid day with focus on the assignment at hand and I knew I needed help. I wanted to get out of Old San Juan, which was primarily designed for the tourist, and venture out to the people that were still suffering from the disaster. So, I recruited my talented friend Jeff Rojas to play my fixer: a person hired by a foreign journalist or crew, often as a translator and guide, and often helps the journalist or crew gain access to interviewees, photography and stories. A fixer is a crucial asset to every production in every foreign country, even domestically. It's important to have someone with an eye on your back and an ear on the ground to can listen and direct, if need be. Near the end of the week, Jeff and I along with a small crew jumped into an Uber and headed out to the rainforest to hopefully meet at least one person to photograph and hear their story. I was anxious, but confident we would find someone - someone willing to tell their story. While many of the roads into the forest were blocked or inaccessible due to damage, we found a small road which took us directly in. As we headed up the mountain deeper into the forest, the amount of residences became more and more bleak. So, I made the call to stop the car and explore a bit of the forest. I wanted a person that looked weathered, seasoned and had a story to tell. But, I didn't want to tell a story of destitution or destruction, more of a story of hope, heroism and courage. The deep forest just didn't have that person I wanted, so we decided to head back down the mountain in the community. Near a small creek, we began to walk up a paved road until I noticed a man peak out his porch window to take a long glance at our crew, all dressed in all black carrying a lot of equipment. We obviously stood out like a sore thumb. The man looked curious and walked out of his home to his backyard while we passed his fence line. He was wearing a white shirt, torn jeans, an old hat and a beat-up pair of Crocs. You can often tell those who carry an emotional weight on their back and he carried a lot. He lawn was manicured and well-kept, but in the back lot sat an old Oldsmobile that looked like it had some stories of its own. There was something about it that sparked interest. I motioned to Jeff that he was our story and Jeff immediately initiated conversation. After a short initial greeting, I motioned to photographer and friend Thomas Ingersoll, who was playing my assistant, that this was our location and to begin setup. We built out camera kit: a Phase One IQ350 Digital Back, a Phase One XF Body and a Schneider Kreuznach 35 mm LS f/3.5 Lens. We used our go-to run-and-gun light setup; a Profoto B2 Location Kit attached to a Benro ProAngel Monopod, modified with a 39" Rotalux Deep Octabox. The man just starting talking and didn't stop. Story after story, he began to unfold the tragic suffering of his experience before and after Hurricane Maria. 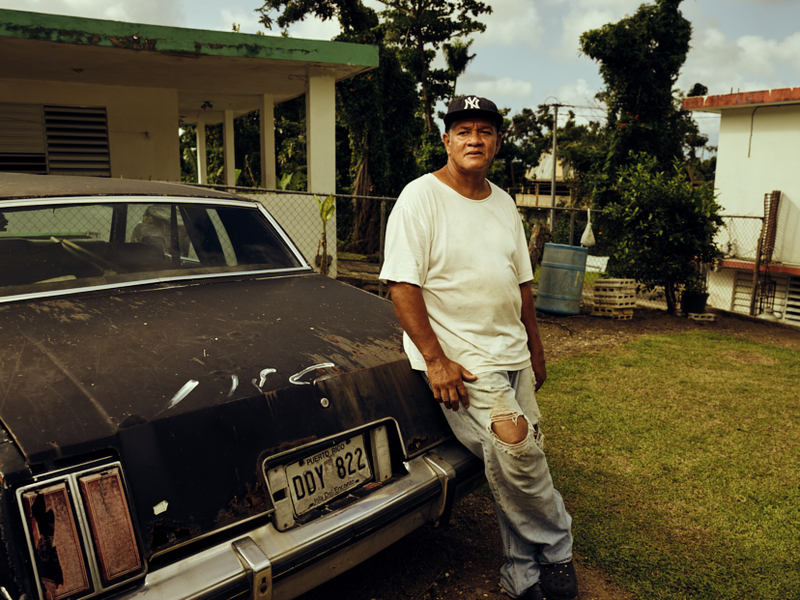 After Hurricane Maria had hit he and his family had no access to water for 3 days. Hundreds of horses had died on the top of the mountain contaminating the fresh water sources down river, so he had to reach clean water from a public pump at the base of the mountain. 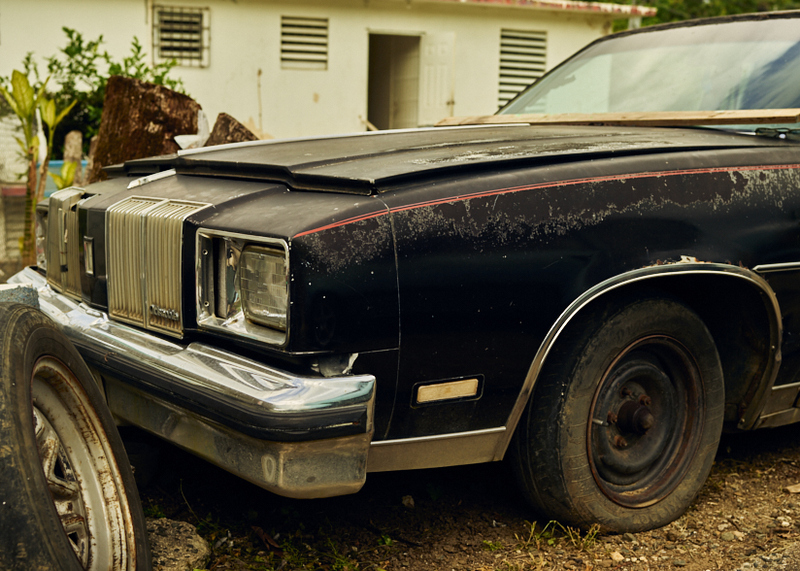 So, he helped clear a road to drive to the bottom of the mountain to fill open buckets of clean water in which he transported back up the mountain in this 1979 Oldsmobile, saving the lives of his family. He spent nearly $150 in gas a week, just transporting water to his family and community. Yseral told stories of waiting hours and hours just to get a bag of ice or staring out the window while the wind peeled the paint off the exterior of his house. His stories were compelling and strong, but by the time he came to a pause he held a smile on his face. A smile I'll never forget. I took the moment to ask him for a quick photograph, then asked him for a quick hat change. He nodded and went inside. He came out with a Navy New York Yankees flat bill. It was perfect. I asked Yseral to sit on the end of the truck of his Oldsmobile and rest comfortably. Once we locked in the artificial light and balanced it with the natural light. I snapped a total of 12 pictures with various composition and thanked Yseral for his time. We exchanged email addresses and headed back to our "Uber," who had conveniently decided to switch off the app and stay with us for a small cash fee. I felt relieved that I had completed the assignment, but something about the story stuck with me through the entire trip and to this day. While every Puerto Rican was affected by Hurricane Maria, I felt honored to tell this story of hope, heroism and courage. Thank you for your strength and spirit Yseral, the world is a better place because of people like you. A special thank you to Alexandra, Thomas, Jeff, Fallon and Seth for the assistance on this project. And, thank you to Gary, Rob and the entire RGG EDU collective for the incredible experience.